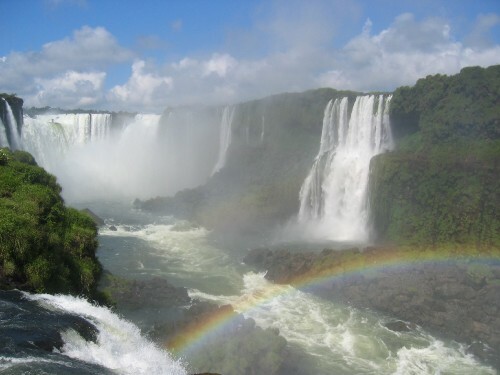 Iguazu Falls, last stop on the agenda in Argentina. Ì`m well behind on the blog at this stage but am still going to give it a crack. Currently in Peru having spent a month in Brazil and a few weeks in Bolivia since I was at the Iguazu Falls, so it could be a long internet session. Iguazu Falls - truly spectacular. I can`t even begin to describe the amount of water that cascades over the rocks there. We did a mini tour inside the park which saw us take a jeep ride through the jungle to supposedly see toucans and possibly a puma. Lies. Saw a lot of nice trees though. The rest of the tour was great though. Boat ride up the river to the falls to get some nice up close pictures, then they take the boat right into the falls so you get absolutely saturated. Great fun. The American couple behind us thought so too. In fact it sounded like they`d never had so much fun in their lives. The elderly couple in front of us not so much. I think nan had just had a perm done and they were not expecting to get quite so wet. After the boat trip we went over to the island in the middle of all the falls, Isla San Martin, walked the top and bottom circuit of the falls to get a different perspectives, and in the afternoon caught the train out to Garganta del Diablo (Devil`s Throat), the biggest and most spectacular of all the falls. (Please excuse all the boring detail, it`s mostly for my own memory when I read back over this once I`m home.) The following day we crossed over to Brasil for the day to see the falls from that side. You don`t get up as close, but do get a great panoramic view of all the waterfalls. Iguazu town - not so spectacular. Had a great time there though. We stayed at a great little hostel with a big BBQ area and pool so spent many hours sitting by the pool while we waited for our Brasillian visas to come through, enjoying cerveca and letting Dan take control of the BBQ again. We strayed from the pool only two days, once to take a walk in the blistering 43 degree heat to the point where the rivers meet that divide Argentina, Brasil and Paraguay. Nice photo op but not a lot else there. Another day we went on an afternoon tour that included and very disappointing mini-rappel down a waterfall and an 800m canopy zip trek. Also spent Australia Day in Iguazu. More pool, beer and BBQ at the hostel, then went out to the big hostel just out of town to celebrate with the rest of the Aussie Gringos. And after 6 days in Iguazu it was time to leave Argentina. Next up, Brasil.